This series connects entrepreneurs to Envision Financial and the province’s leading tools and resources through a mix of educational workshops, networking and exhibits. This year, the educational events will reach communities in the business hubs of Surrey and Coquitlam. 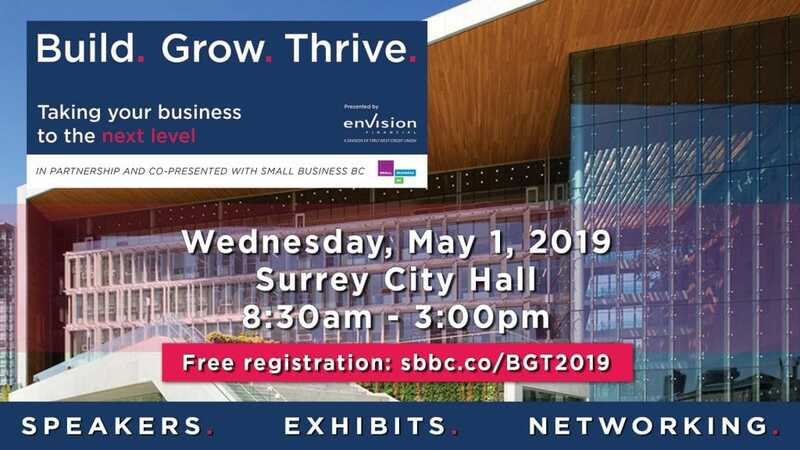 Join us on May 1, 2019 at Surrey City Hall to discover resources and programs available to help build and maintain a strong and resilient small business. Financing beyond the early stages of business can prove to be difficult. There are a lot of factors that can help you prepare and decide on what options are right for your current structure and trajectory. In this panel segment, you’ll hear from Envision Financial along with some Small Business BC related affiliates on how to navigate the road to getting the resources you need to build out your business into its maturity. 10:20AM – How to Attract and Keep Your Star Employees – Presented by Christina Stewart, President of Client Engagement, Praxis Performance Group Inc. This session will provide you with realistic options to implement or strengthen your attraction program and fortify your retention. Using data, experience and client stories this presentation allows ample time for discussion and questions. You will come away with solid ideas for improving and strengthening retention and recruitment in your organization. The customers that will provide the spark to ignite your small business are out there, you just need to find them. Join Mark Eversfield, Small Business BC’s Market Research and Data Guru as he explains how to gather information about your current and potential customers, industry trends and competition to help make strategic business decisions. Growing a business is a relative measure depending on where you start, what your goals are and how they change. This panel will discuss individual experiences of growth, from planning to goal setting to adapting to change along the way. How you grow, where you grow, and when you grow will all be unique experiences to each business. Learn tips and approaches from those who have gone down that path already and find a few shortcuts for the road ahead. It is important to protect your growing business from possible threats. During this presentation, Envision Financial Insurance will take you through the ways to assess your needs and select the right products to cover your exposure as you continue to thrive towards your business goals. With an increasingly digital and social element to marketing your small business, it is important to understand the different channels and tools at your disposal. Mastering these devices can help you connect with people and ultimately lead them naturally towards becoming your customer. Building community can also build sales! If you’re within the areas of the Lower Mainland and the Fraser Valley and own a small business, or are looking to start one, don’t miss out on this full-day event. Can’t make the whole day? No problem! Simply pop in for the sessions you’re interested in. Seats are limited, so reserve yours today!